Why did the people on a course I ran learn what they learned? Fig. 1. 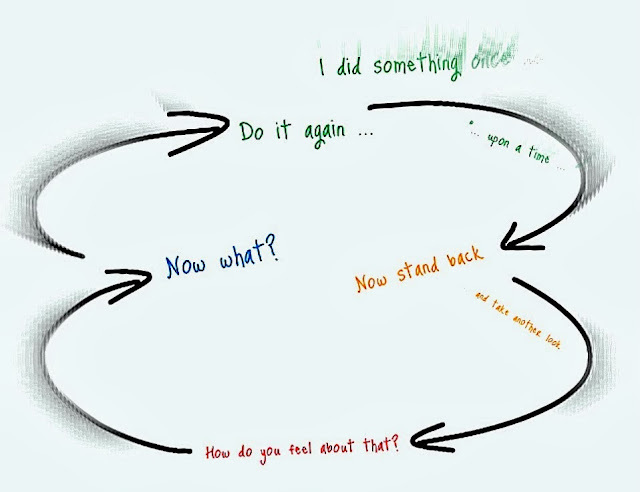 Kolb’s ‘Experiential Learning Cycle’ reversioned. 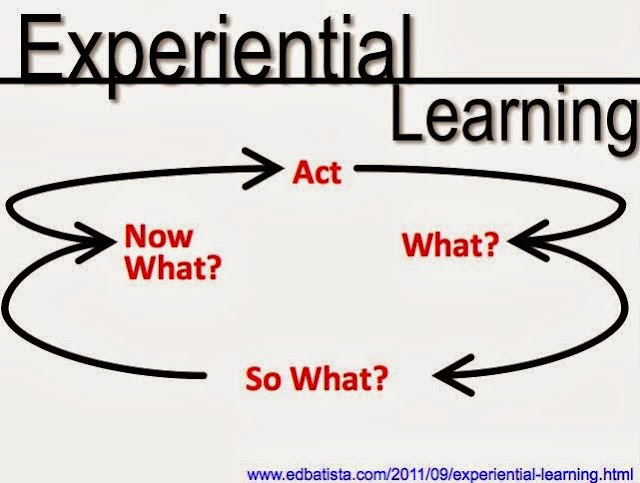 This is my take on Kolb’s ‘Experiential Learning Cycle’ which I will use to explore what I ‘did’. I ran a creative problem solving workshop. The motivation for attendees was to pick up some creative problem solving techniques, to solve a problem we had with using social media and to do some team building. The objective for me was to crack this problem and to introduce a more creative and collaborative approach to problem solving. I couldn’t help but draw on experience as a Club Swimming Coach planning programmes of swimming for a squad swimmers and as the ‘workforce development’ running training programmes for our club’s teachers and coaches. Planning and preparation when you are putting athletes in the pool several times a week over months is vital. On a smaller scale this workshop required a schedule, to the minute, with some contingency, allowing you to build in flexibility for both content and timings. The plan was for five to six creative problem solving techniques to be used, top and tailed by, using terms from swimming, a ‘warm up’ and a ‘warm down’. The modus operandi of the Residential School had been to introduce, experience and play with as many creative problem solving techniques as possible. ‘Bunch of Bananas’ is a creative problem solving technique that suggests that you include in the group a ‘plant’ – a person over whom other’s will slip, like the proverbial banana. My take on this was to introduce two outsiders – a Russian academic who would bring a different take on things and the a mathematician and senior programmer. Fig. 5. ‘Mother-in-law, Samurai, Tiger’ is a great warm up, while stretching like an Olympic swimmer was an apt ‘warm down’ at the end of the session. We did a warm up called ‘Mother-in-law, Samurai, Tiger’. This is the team equivalent of ‘Paper, Scissors, Stone’ where two teams face each other and on the count of three, having agreed what their response would as a team, they either ‘Tut-tut’ and wag their finger like a mother-in-law, ‘growl’ and get their claws out like a Tiger, or shout ‘ha!’ while posing like a Samurai warrior brandishing his sword. This is the ‘warm down’ to stick with the swimming coaching metaphor was to have participants get into the ‘streamlined’ position that swimmers adopt – essentially a stretching exercise. Fig. 6. Human Sculpture and Timeline are useful ways to have people look at and feel a problem in a different way and from a different angle. In between we did a mixture of physical and mental activities, including Human Sculpture where one person becomes the sculptor and uses everyone else to form a tableau or sculpture that expresses their talk on the problem. Another was timeline where you imagine looking at the problem from the perspective of the past and future. Standing back I’d say that running a workshop for colleagues has advantages and disadvantages. How would a director or line manager feel about their views being exposed like this. On the other hand if well managed it becomes a team building exercise too. The challenge is to know what risks to take and how to build in flexibility, not just in timing, but in the kind of activities. This requires that despite the plan you are alert to signals that suggest an activity should be developed or dropped. Workshops and seminars I take have a common element – there is ‘hands on’ activity. The goal is that at the end of the session people feel confident that they could do these things themselves. I’m less comfortable about teaching where the communication is one way – me talking and them taking notes. I value encouraging self-discover and people being on their feet, interacting and having fun. It was collaborative and iterative, it was problem-based learning that used communication skills. How did you feel about that ? Fig. 7. How we like to be ‘in the flow’ rather either bored or stressed from being too challenged. Mihaly Csikszentmihalyi (1975) Mental state in terms of challenge level and skill level. I felt ‘in the flow’ for most of the time, suitably challenged and never bored. Though anxious and surprised when a colleague gave me a drubbing the day after feeling that they had been tricked into attending. This came as a surprise, the other surprise was how away from their desk and computers the apparently introverted could become so animated and responsive. I felt like a party planner. I was hosting an event. The atmosphere of controlled enthusiasm would be down to me. I would be, to use a French expression, the ‘animateur’ or ‘realisateur’ – the one who would make this happen and bring it to life. On this occasion we delivered a couple of distinct responses to the problem. People reflected on the experienced and felt it was both enjoyable and of practical value. The request was not that others would host such an exercise, but that I would do more. I was subsequently booked to run a few more workshops on specific topics with different groups in the faculty. The question that we couldn’t resolve was whether were a ‘creative organisation’ ? My own conclusion being that we quite palpably were not. Henry, J and the course team (2006, 2010) ‘Creativity, Cognition and Development” Book 1 B822 Creativity, Innovation and Change. Kolb, D.A. 1984 Experiential Learning: Experience as the Source of Learning and Development, Englewood Cliffs, NJ: Prentice-Hall. Tassoul, M, & Buijs, J ( 2007, )’Clustering: An Essential Step from Diverging to Converging’, Creativity & Innovation Management, 16, 1, pp. 16-26, Business Source Complete, EBSCOhost, viewed 22 February 2014. I often share a post I am writing as I do so. 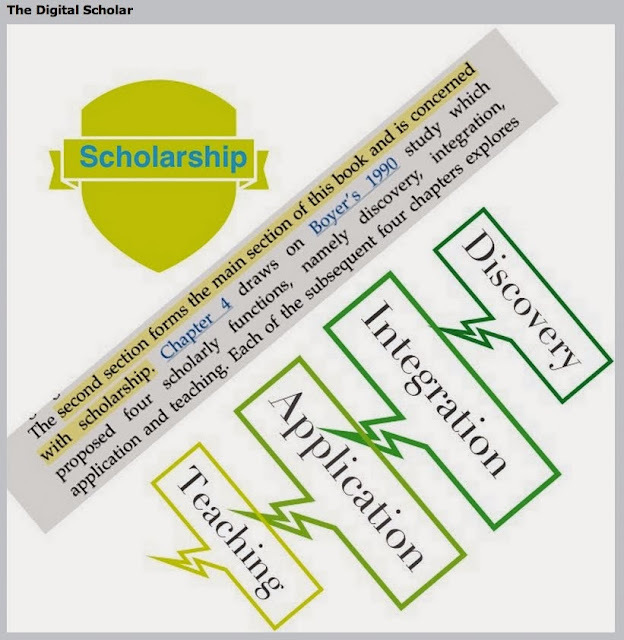 In this case having identified the story to tell : running a workshop to solve a ‘messy’ business problem I am pulling together or creating supporting images, in the above case a grab and mashup from Martin Weller’s book ‘The Digital Scholar’ – my goal is to be recognised as one. 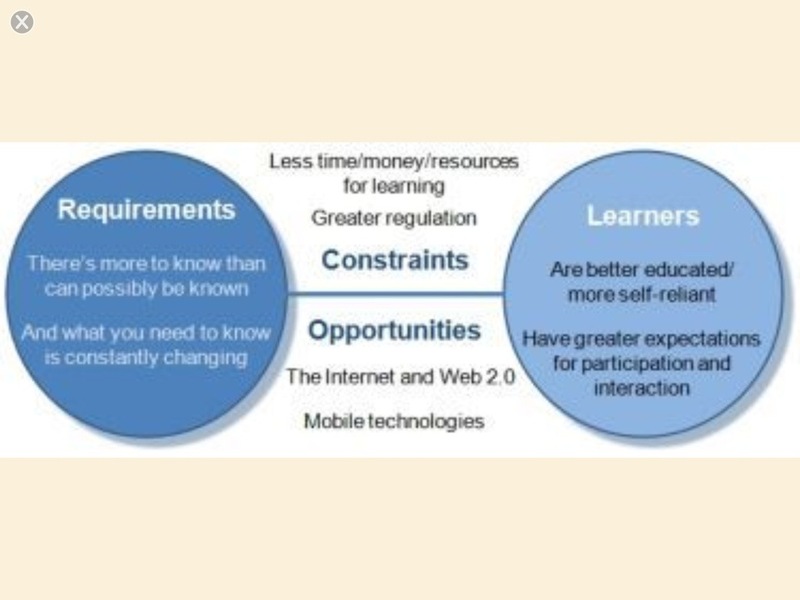 In a forum post as an Open University ‘Master of arts in Open and Distance Education’ (I graduated in early 2013) I suggested this could be achieved in four years – John Seely Brown thinks that eLearning speeds things up, while Weller reckons on ten years. Fig.1. 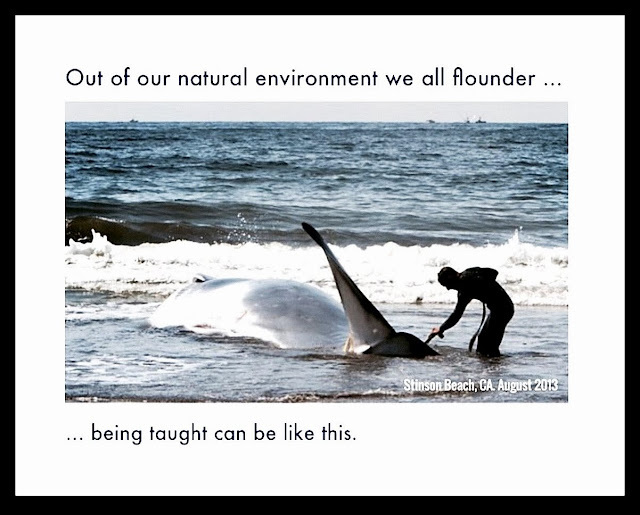 Rescue having failed a 4 tonne whale is dragged from Stinson Beach. As a student on Oxford Brookes University’s online course ‘First Steps into Teaching and Learning 2014’ here in week 4 we have been challenged to consider an experience from teaching or being taught and in a five minute presentation reflect on this. My interest is teaching postgraduates and/or ‘in the workplace’. I should be feeling I’ve stumbled into the right time and place with this one having just given a ten minute presentation online as part of the Open University Masters in Open and Distance Education module H818: The Networked Practitioner, however with that one, despite every expectation to exploit my love of and experience with linear and interactive media I resorted to a Powerpoint. I needed to improve the script up to the line and this offered the flexibility I could not have had with a Prezi or video. There were too many cumbersome technical barriers and trips that I wasn’t happy to pursue or risk. What I’m doing here is thinking through a presentation I need to prepare. Sharing this, if and where feedback can be garnered, then informs the decisions I take. My immediate idea, often my best, is to do a selfie-video talking to camera while hurtling around a roller-coaster at Thorp Park. It would sum up the terror, thrill, highs and lows of taking a day long workshop with a class of some 40 year 9s (12/13 year olds) in a secondary school that had/has a checkered history. The second idea, to change the setting radically, would be a workshop with nine on creative problem solving – the objective was to come up with answers to a messy problem, though the motivation to be present for most was to experience a variety of creative problem solving activities that I had lined up. This nine in an organisation, included MBAs, prospective MBAs, a senior lecture, junior and senior managers and officers: colleagues and invited guests from different departments. This example is probably the most appropriate. A third might be something I attended as a student – apt because doing this in 2009/2010 in part stimulated me to take an interest in learning: I wanted to know what was going wrong. Here we had prospective club swimming coaches doing everything that was unnatural to them – working from a hefty tome of paper, sitting through a lecture/seminar and expecting assessment to be achieved by filling in the blanks on course sheet handouts. This from people with few exceptions who left school with few or no qualifications – often troubled by Dyslexia. They were swimming coaches to dodge this very kind of experience. It was, you could tell, hell for some. The misalignment could not have been greater. Here the immediate visual image, apt given the subject matter, would be to watch a fish out of water drown – or nearly drown and be rescued. What really grated for me in this course was the rubbish that was taught – too many gross simplifications and spurious science. Based on the above I should challenge myself to do the video as I need to crack loading and editing. The fish out of water, whale actually, I can illustrate from photographs and the experience this summer of being present as a 4 tonne whale beached and drowned on Stinson Beach, California (See Fig.1. above). Several speakers. All valuable. Notes. Reflection to follow. Established – 3–4 more likely to report performance improvement. The gardeners are not attending conferences, they are doing and reviewing. Defining need – understand the soil in your garden – organisation wide strategy. Work Context – integrate learning technical environment, work culture, talent management. Compared with the average top organisations encourage time for reflection. Top performeers – share expeience and solve problems. change management and marketing to engage influential stakeholders. Communicating success back into the organisation. Top are x3 as likely to measure specific benefits and align when aligning success. A few weeks ago I shared a few books I had read, cover-to-cover, extolling the virtues of listening to someone’s thesis over several hours or days rather than consuming only the sound bites offered by the Internet. This was one of the recommendations. The platform was the Linkedin group ‘Giants, Wizards and Goblins’ for alumni of the OU MBA module B822 ‘Creativity, Innovation and Change’. I can pass on the recommendation as I enter my second read – a second round of highlighting, adding notes and sharing excerpts via Twitter and Facebook – no copyright infringement here surely – like any of us I am promoting the book and the man, as well as into the orignal interest group in Linkedin. I’ll get my head around it vicariously. For the umpteenth time I might like to ask an author to sign the book, but yet again I only have the eBook. Is there a problem here looking for a solution? Perhaps I should put it to Clive Shepherd this morning at an event hosted by e-learning agency Kineo at the City & Guilds, London. Studying entirely online with the Open University (Masters in Open and Distance Education) I find I seek out opportunties such as this, to hear someone talk, to be in the audience, so as to sense ideas as they bubble up in a context that makes them more likely to adhere as a memory. The advantage of course doing this online is that we generally speak through our fingertips so there is a lasting record that is more easily absorbed. For me, sixty ideas worth sharing from the book ‘The New Learning Architect’ may coalesce into five or six of most significance and value to my current projects and plans.